Most consumers know very little about how tire sizing works and often overlook the important details that effect the handling, wear and life of a tire. When you look at the sidewall of your tire, there is so much information, it’s hard to find the dang size sometimes! So let’s break down the details of tire sizing and make it easier to buy your next set. P (Passenger): This designation is the most common of the service types and indicates the tire is size is P-metric. This service type indicates a passenger vehicle use which can include cars, minivans, sport utility vehicles and light load pick up trucks. T (Temporary Spare): A “T” indicates the tire is a spare tire, only to be used until the vehicles standard tire is repaired or replaced. There are often other restrictions to consider, including max speed capacity, when driving on a T service type tire. LT (Light Truck): This letter designation can e found at the beginning or end of the tire size for light trucks. In most cases the LT will be at the beginning and implies the tire is for use on a Light Truck capable of towing large trailers and carrying heavy loads. 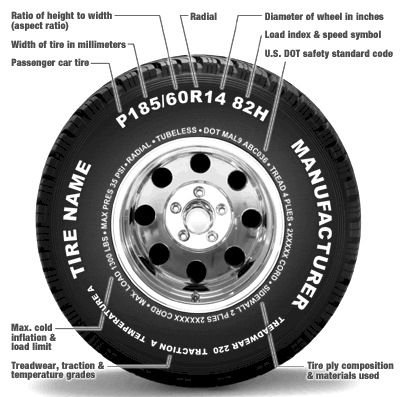 If the LT is at the end of the tire size, this means the tire is meant for Light Trucks using wide base or flotation type tires or is using the earlier “numeric” sizing system for Light Trucks. ST (Service Trailer): This service type indicates tires for service trailers. ST service type tires should never be installed on a vehicle. Trailer tires are made and operate differently than vehicle tires and are designed to carry and pull large loads. ST tires should only be installed on trailers.